Russia’s economy sustained a blow from Western sanctions and remained strong; it should use them to achieve "new development frontiers,” according to President Vladimir Putin. Anti-Russia sanctions imposed by Western countries are not very efficient as their pressure is useless and senseless, Putin said during his annual question and answer session Thursday. The President stressed that Russia should use the current situation and focus on new horizons of development. Pointing to the issue of import substitution, Vladimir Putin said the country is forced to quickly push ahead with it considering the sanctions. 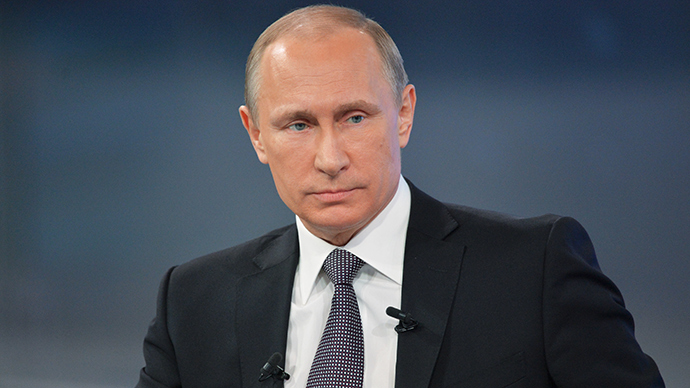 Putin also thinks it is inappropriate to compare the sanctions’ situation of Russia with that in Iran. "Russia is not Iran, our economy is bigger, and much more diversified than in Iran, and we are not conducting an energy resource policy as the Iranian government conducts," he explained. Moreover, the power industry is much more a market in Russia than in other oil and gas-producing countries, according to the Russian President. On August 6 last year the Russian President banned agricultural products from the EU, USA, Australia, Norway and Canada, responding to a new round of anti-Russia sanctions taken by the Western countries over the crisis in Ukraine. Putin then described the political tools of pressure being used against the Russian economy as unacceptable and added that they go against international rules. A day later Prime Minister Dmitry Medvedev signed a decree banning the imports of beef, pork, poultry meat, fish, cheese, milk, vegetables and fruit from those countries for a year. The embargo was said would boost domestic agriculture and become a unique opportunity to develop import substitution. Meanwhile, in March the Kremlin spokesperson said Russia might loosen its embargo on food from some EU countries such as Greece by allowing agricultural products to be processed within the country. Greek PM Alexis Tsipras’ visit to Moscow last week to meet Vladimir Putin has led to a number of proposals that could end the embargo on food products from the country. Greece has been hit especially hard by the food ban, as more than 40 percent of Greek exports are to Russia. Russia is also considering rescinding food sanctions against Cyprus and Hungary.